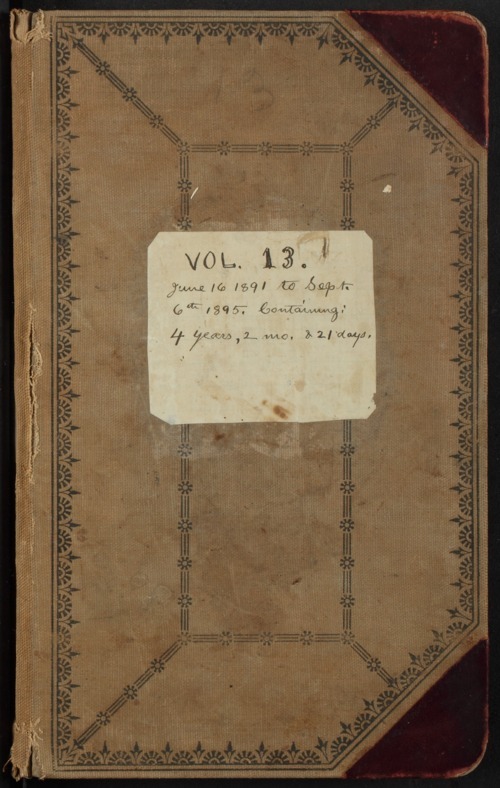 Volume thirteen of Samuel James Reader's diary. In this volume, Reader expresses his enjoyment of reading and photography. After taking pictures, Reader would number the prints in the margins of his diary as he developed them in his home photo lab. In November 1892, Reader voted the People's Party ticket writing in the name of Charles Curtis for Fourth District Congressman. In 1894, he voted for Governor Lorenzo Lewelling on the Prohibition ticket and for the suffrage amendment to the Kansas constitution. In addition to English, some of the diary is written in shorthand.